“R and MATLAB are pretty consistent throughout the year” – those are research related programming languages and it make sense that student to advanced degrees use them all around the year. 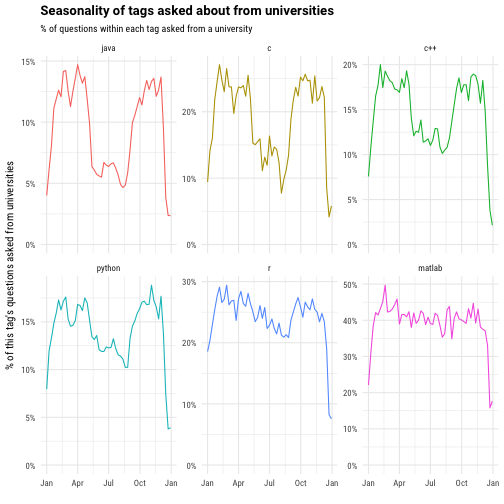 Python is also used a lot in research and one can see that the decrease during the the summer vacation is smaller than the decrease in Java and C.
Public universities vs Private universities – the list of the most common tags in the public universities include beside Microsoft products also – while-loop, methods, input, linked-list, if-statement, loops, etc. Those are all theoretical \ foundation related concepts. On the other hand the private list contain not theoretical concepts beside web-scraping, but stack specific products, e.g – mongodb, iphone, aws, flask, heroku, etc. For me that flags either lecturers on private universities explain better theoretical concepts and therefore the students don’t ask questions about them or that private universities invest more on preparing the students to the labor market and therefore use more industry products. 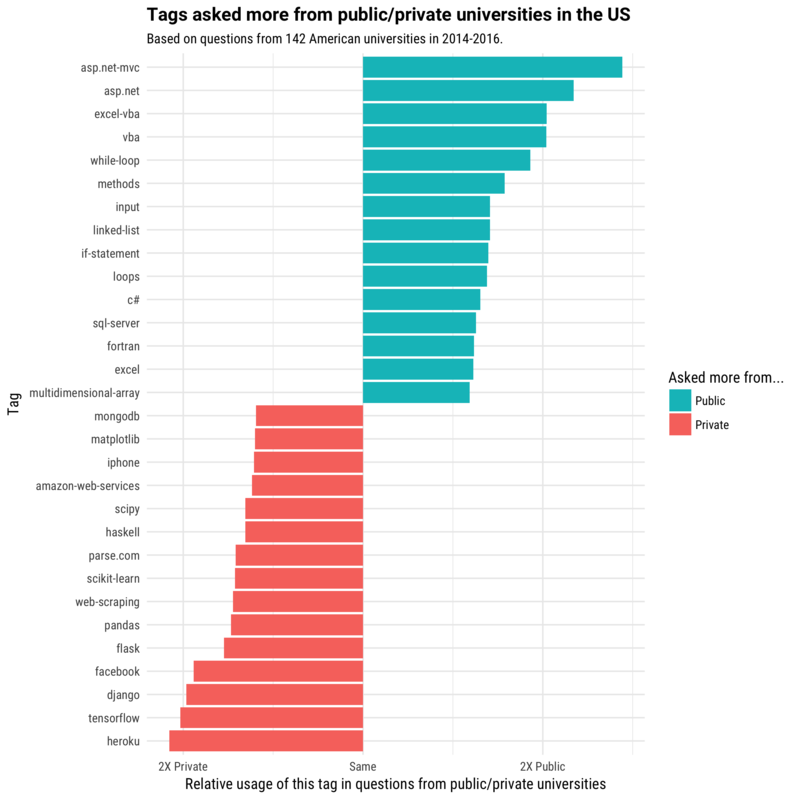 This post end with a chart of the Universities that asked the most R questions relative to other technologies – “The most R-heavy schools … and some are recognizable as having prominent statistics programs”. This brings me to another analysis I would like to see – what are the majors of the students who asked those questions? And of course segmenting it together with the other analysis – e.g. how female students uses stackoverflow versus of male students use it. In which universities students work hardest in the weekends? Which tag’s weekend activity has decreased the most? As SO suggest the usage of some of the technologies decreased on weekends because the usage of those technologies decreased on general such as SVN and probably RoR3 and visual-studio-2012. On the other hands, other technologies such as Scala and maybe Azure become more popular and mainstream so it is no longer only geeks technologies used in weekends. To confirm this claim it would be interesting to see if the currently increased weekend technologies (e.g. android-fragments, android-layout, unity3d, etc.) will become mainstream in few years. It is also interesting to see if the weekend technologies are also technologies used at after work hours (this is of course timezone dependent). Also interesting to see the difficulty levels of weekend posts versus workdays posts. Does users use weekend to learn new technologies and therefore ask relative basic questions or they dive in to a technology and ask advanced questions. The difficulty of the questions can be evaluated by the time it took the get answer (more complex question -> longer time to get answer), up-votes, etc. This is noted also in the post itself. It is also interesting to see which other populations were under represented in the survey. An interesting analysis I would like to see is the sentiment (aggressiveness vs calm \ informative in the answers) segmented by the repliers gender. Maybe also as a function of the asker gender. I must say the personally never noticed the asker’s gender.